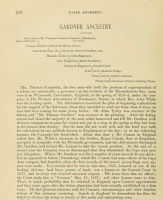 The book on Paine Ancestry (published 1912) has a Chapter on Thomas whose grandson, Samuel, son of George, married Elizabeth (Brown) Grafton, as her second husband; Thomas is, then, an ancestor of the author. We earlier showed descendants of Samuel (Hardin & Hall) when we started to look at the generations. The book has a nice arrangement. It covers the Paine genealogy up to one person; as well, the collateral families are handled. For each, there is a lineage chart and some text. The book has nice words about Thomas, calling him "practically, a governor" as an example. It brings up an interesting point, too. Where was Thomas, and Margaret, from 1626 (when Conant and the old planters - mind you, Thomas is not on that list -- went over to Naumkeag) to his 1636 entry into the church? The next year, Thomas became a freeman. 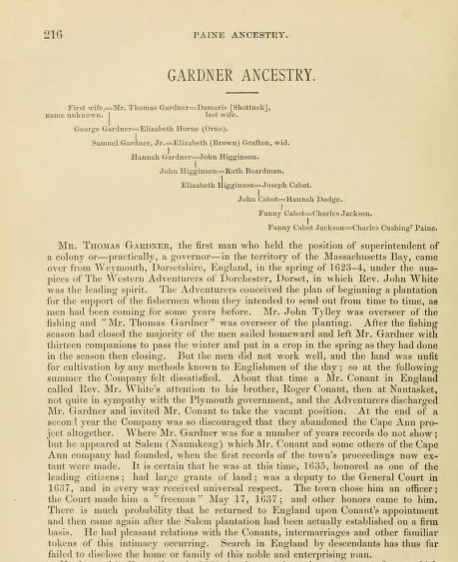 The book suggests that perhaps the Gardners went back to England and then returned later. If that were the case, there would have been ship records, perhaps. We're talking about a ten year gap. Earlier, we proposed that Thomas deigned to join the church and register with the state when it was of benefit to his kids. When Conant, and crew, went over to Naumkeag, they left the house. Someone had to keep it up, as later Endicott had it moved over to the Salem area. Cape Ann and Salem are close enough that regular trips back and forth are a great possibility. There were plantings sufficient in Cape Ann to sustain the group. It was [not] producing enough to ship back to England that was the problem. So, one could figure that farming work continued in the Cape Ann area. As said before. Thomas was self-sufficient long before Emerson characterized the trait. And, he was educated. And, as mentioned in the Mary (Gardner) Coffin post, Richard, son of Thomas and Margaret, was said to be of considerable education. That, no doubt, came via his parents. Another thing that happened in 1636 was John Tylly being killed in a conflict with the Pequot. Was that a factor? People gather in times of trouble. In 1637, after becoming a freeman, Thomas was on the General Court (Felt, pg 110) with William Hathorne. There are many scenarios that we could offer with regard to Thomas' absence from the records for that ten year period. We could also search out anything that has already been written. I think that this type of inquiry is legitimate for Thomas' descendants to look into. Even if it turns out to be a puzzlement, gathering all of the stories, categorized like this, would be of interest to future generations. As well, it would further Dr. Frank A. 's work which doesn't explicitly talk about the moving to Naumkeag. However, Dr. Frank does say that Thomas was mentioned in a London meeting in 1629 (Felt, pg 126). 01/12/2019 -- Add image from the book of the Paine sisters. Also, that allows a thumbnail. 09/09/2013 -- Forgot to update this earlier. But, the post related to Gardner's Beacon, Vol. II, No. 6, discusses that Thomas had no shadow over him as was feared by some old planters (would Dr. Frank, today, still want to include Thomas in the group?). 05/01/2012 -- If Thomas and Margaret had gone back to England, son John would have told the tale. Methinks that they might have shuffled back and forth, perhaps keeping the Cape Ann house in order until Endicott had it moved. 02/03/2012 -- The period in question here is from the Cape Ann time to 1637 Salem. After 1656, we could answer this way, in part: Thomas was visiting Joseph and Ann in their house. 01/28/2011 -- There are several things to figure out. Dr. Frank mentions that a Margaret Gardner joined the church in Salem in 1639 (see Felt). Pope says that this Margaret was of Ipswich and married to Edmund Gardner. The Great Migration write-up says that Thomas' first wife may have died at the birth of Seeth in 1636. 01/27/2012 -- In reporting the death of Thomas' son, Thomas, the Annals (Felt, pg 246) seem to have some dates mixed up, though it does mention Margaret as the first wife. The Great Migration does not.